Westwood can feel like a college town in the midst of a big city. UCLA’s 419-acre campus is the Westside neighborhood’s centerpiece, a hub of activity with 45,428 students, graduate students, and medical residents as of Fall 2017. But until recently, very few of those students actually had any say in the decision-making processes that shaped the neighborhood’s present and future. Formed and certified by the city in 2010, the Westwood Neighborhood Council was the neighborhood’s certified advisory board, advising City Council on everything from historic preservation to what kinds of entertainment could take place in the neighborhood’s bars. And they took that responsibility seriously. “There shall be no dancing, there shall be no live music, there shall be no reduced drink prices or happy hours,” says Michael Skiles, third-term president of UCLA’s Graduate Students Association, listing some of the restrictions put in place by the neighborhood council. But the Footloose-style rules placed on drinking and dancing weren’t students’ primary concern. Their focus was the same issue that recently inaugurated California governor Gavin Newsom made one of his primary talking points: housing affordability. The Westwood Neighborhood Council, which Skiles says was “heavily skewed toward older white homeowners,” frequently objected to new housing proposed by UCLA and other developers if, for instance, a development would block current homeowners’ views. The council advocated for mandated parking requirements, which raised the cost per unit of housing, and in turn, the cost of rent for students. By 2018, after attempting to find several other ways to incorporate themselves into the political structure of the neighborhood, students and their progressive allies had enough. They decided to form their own neighborhood council and started Westwood Forward, a separatist movement to split the region into the North Westwood Neighborhood Council, which would encompass UCLA and the surrounding area, and the Westwood Neighborhood Council, which would retain control of the southern portion of the tight-knit community. While the narrative is typically that students are unengaged and disinterested in politics, astoundingly, with a total of 3,500 voters, the coalition of students and allied business people and homeowners won with 57 percent of the vote. Paavo Monkkonen, an associate professor of urban planning and public policy at the UCLA Luskin School of Public Policy, says that for decades, single-family homeowners in neighborhoods adjacent to campus worked against the interests of UCLA students, faculty, and staff, “by restricting bike lanes, nightlife, and new housing.” The previous council was the official voice of the area, and, according to Monkkonen, it too often used that voice to object to necessary new housing construction. In September, Monkkonen released a position paper on how and why opportunities for new, dense housing to address the state’s housing need are often blocked by vocal opposition neighborhood councils like in Westwood. In part, Monkkonen concluded, “The vocal advocacy of a handful of neighbors is often framed as local democracy, but many of these processes exclude the majority of a neighborhood’s residents and explicitly favor those with more money and time.” A member of the Westwood Neighborhood Council declined to comment for this article. After students won their own neighborhood council, in addition to his role at the Graduate Students Association, Skiles became the first elected North Westwood Neighborhood Council president. He says it wasn’t just students who achieved the win, but also a coalition of business leaders, the local Persian community, UCLA staff and faculty, and homeowners who didn’t support the old conservative neighborhood council regime. Business leaders were incensed, he says, by the heavy restrictions placed on their bars and restaurants, as well as the dearth of opportunities for new businesses in the area. Others were upset by the council’s decision to deny an alcohol permit to an Iranian man because “he did not understand English.” In all, Skiles says that most students and community members had very little idea what their neighborhood council was doing: elections and meetings were far from the campus and students weren’t encouraged to weigh in on any substantive changes to policy. While the original Westwood Neighborhood council still retains control of the southern portion of Westwood, things have changed since the election. L.A. City Councilman Paul Koretz, who represents the area, has been explicit about his desire to hear the thoughts of the new neighborhood council before making any decisions that fall within their jurisdiction. Skiles says the new council is diverse and in line with forward-looking policy that hopefully will keep alumni in the area, instead of pushing them away: more housing density around affordable transportation, and of course, more businesses like bars and restaurants that cater to younger people. Soon to be an alumnus himself, Skiles doesn’t plan on leaving UCLA any time soon. He came to UCLA first as a masters student. He met his girlfriend, soon-to-be wife, while she was still a pediatric resident at UCLA and before she became a kidney specialist at UCLA Medical. 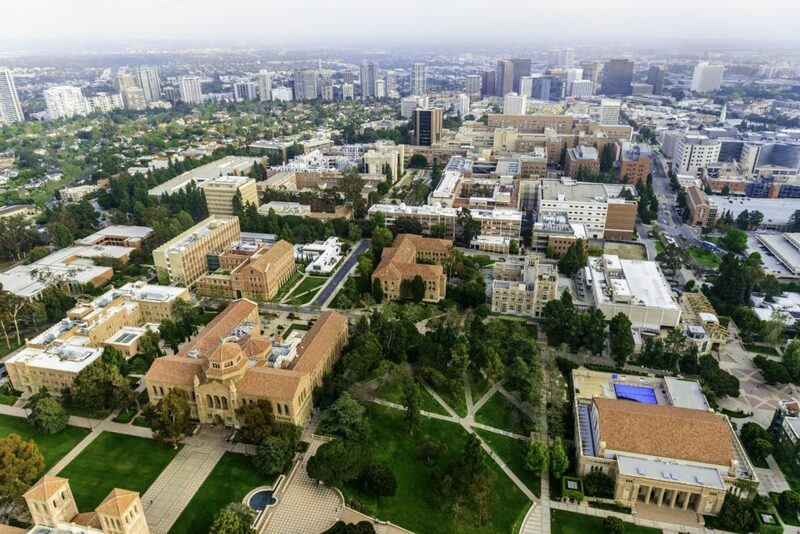 Now as a PhD candidate, while he isn’t planning to leave, Skiles does have a few words of advice for policymakers in places where California’s other universities are located. “Ignoring students just because we won’t be here long enough to reap the rewards is the same sort of catastrophic mistake that today’s politicians are making ignoring climate change because they think that hopefully they’ll be dead before our planet will eviscerate in a puff of smoke,” he says.